Do you know someone who always goes above and beyond the call of duty who is in need of help with their home? We're looking for deserving people facing everyday design problems, who deserve our help - so please let us know who YOU'D like to surprise!! We want to help people who are living with everyday design dilemmas. Do you know someone whose home is no longer fit for purpose? Perhaps their family circumstances have changed. Do you know anyone who's decorating plans have been scuppered by the recession? Or can't afford to move, so want to upgrade what they have to make it last another 10 years? Perhaps they're working from home to earn a bit of extra cash for the family, but their desk is in the kid's playroom! 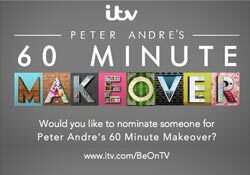 If you would like to nominate someone please follow this link: http://www.itv.com/beontv/shows/peter-andres-60-minute-makeover or fill out the attached application form asap and get it back to me. We are meeting potential people from next week so please don't delay if you know someone deserving. Please feel free to also pass this information onto colleagues, friends and family who also might be interested.